The stabbing murder on Oct. 10 of an ethnic Russian, Yegor Shcherbakov, 25, apparently by a Muslim from Azerbaijan, led to anti-migrant disturbances in Moscow, vandalism and assaults, the arrest of 1,200, and brought a major tension in Russian life to the fore. Not only do ethnic Muslims account for 21-23 million of Russia's total population of 144 million, or 15 percent, but their proportion is fast growing. Alcoholism-plagued ethnic Russians are said to have European birth rates and African death rates, with the former just 1.4 per woman and the latter 60 years for men. In Moscow, ethnic Christian women have 1.1 child. Eid al-Fitr prayers in Moscow on Oct. 15, demonstrating the Muslim numbers and solidarity in that city. In contrast, Muslim women bear 2.3 children on average and have fewer abortions than their Russian counterparts. In Moscow, Tatar women have 6 children and Chechen and Ingush women have 10. In addition, some 3-4 million Muslims have moved to Russia from ex-republics of the U.S.S.R., mainly from Azerbaijan and Kazakhstan; and some ethnic Russians are converting to Islam. These trends point to Christians declining in numbers by 0.6 percent a year and Muslims increasing by that same amount, which will have dramatic effects over time. Some analysts foresee Muslims becoming a majority in the twenty-first century – a demographic revolution that would fundamentally change the country's character. Paul Goble, an expert on Russian minorities, concludes that "Russia is going through a religious transformation that will be of even greater consequence for the international community than the collapse of the Soviet Union." A Russian commentator he quotes envisions a mosque on Red Square in Moscow. The facile assumption that Moscow is and will remain Western-oriented "is no longer valid," he argues. In particular, he predicts that the Muslim demographic surge "will have a profound impact on Russian foreign policy." Within a few years, Muslims will make up half the conscripts in the Russian army. Joseph A. 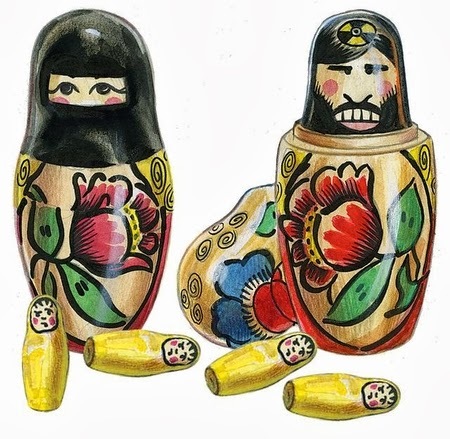 D'Agostino of the Population Research Institute asks: "Will such a military operate effectively given the fury that many domestic Muslims feel toward the Russian military's tactics in the Muslim region of Chechnya? What if other Muslim regions of Russia—some of which contain huge oil reserves—rebel against Moscow? Will Muslim soldiers fight and kill to keep them part of the Russian motherland?" Russia's increasingly confident Muslims, who constitute a majority of 57 out of the country's 182 ethnic groups, have started to use the term Muslim Russia to signal their ambitions. According to Muslim analyst Daniyal Isayev, this term affirms that Islam is "an inalienable part of Russia" and that "Russia as a state and civilization could not exist without Islam and the Muslims." He notes that Muslims preceded ethnic Russians in much of the territory that is now Russia. His sweeping claims for Muslims include the exaggerations that they made critical contributions to Russia's culture and its military victories. 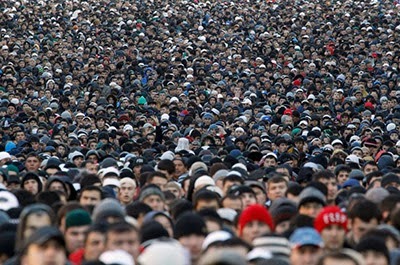 Such talk causes ethnic Russians to shudder about the country's population loss of at least 700,000 people a year, return to their faith, and turn against Muslims. The results include biased media portrayals, attacks on mosques and other crimes, efforts to block Muslim immigration, and the rise of extreme Russian nationalist groups such as Alexander Belov's "Movement against Illegal Immigration." 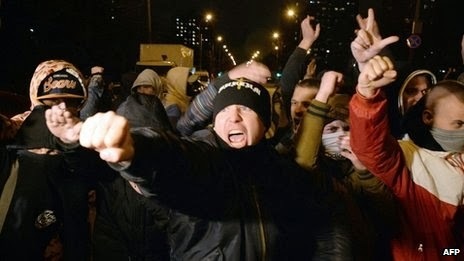 Ethnic Russians yelling "Russia for the Russians" at an anti-migrant riot following the murder of Yegor Shcherbakov. The Kremlin has responded to the issue in contradictory ways. Then-president Dmitry Medvedev in 2009 tried appeasement by stressing the importance of Islam to Russia, noting that "Muslim foundations are making an important contribution to promoting peace in society, providing spiritual and moral education for many people, as well as fighting extremism and xenophobia." He also announced that, due to its large Muslim population, "Russia does not need to seek friendship with the Muslim world: Our country is an organic part of this world." Illustration by Alexander Hunter for The Washington Times. But, as Ilan Berman of the American Foreign Policy Council points out, "the Kremlin has discriminated against its Muslim minority and ignored (even abetted) the rise of corrosive xenophobia among its citizens. This has bred resentment and alienation among Russia's Muslims – sentiments that radical Islamic groups have been all too eager to exploit." Added to existing Islamic supremacist attitudes, this results in an increasingly restive Muslim minority. Discussions of Islam in Europe tend to focus on places like Britain and Sweden but Russia, the country with the largest Muslim community in both relative and absolute terms, is above all the place to watch. The anti-migrant violence this week will surely be followed by much worse problems. Mr. Pipes (DanielPipes.org) is president of the Middle East Forum. © 2013 by Daniel Pipes. All rights reserved. Technorati Tag: Islam and Russia.